It has been a remarkable few years for Qatar, with the resilience of its economy put to the test not only by the rapid fall in commodity prices that took place from June 2014, but also, and far more significantly, by the political and economic embargo that was imposed on the country in June 2017. While securing new suppliers of basic goods as supermarket shelves emptied in the hours following the embargo was the most pressing concern for the authorities, the more difficult task of reassuring international investors that the country was still a safe bet required longer-term efforts. It is in light of this that OBG is delighted to publish the results of its OBG Business Barometer: Qatar CEO Survey for 2019, with the results drawn from interviews conducted with over 100 of the country’s top CEOs. Signs are overwhelmingly positive and the general consensus in the local business community is that Qatar has not only weathered the storm, but has come out fighting. Indeed 84% of the CEOs we spoke to were either positive or very positive about local business conditions for the coming 12 months. While one might understandably suspect a case of over-bullishness here on the part of Qatari companies, digging down into the figures reveals that the sentiment is shared by both locals and foreigners alike: just under half (43%) of the CEOs we surveyed were heads of non-local companies, with 85% of them positive or very positive about the year ahead. So, is optimism for the future an indication that a resolution to the crisis might be on the cards? News reports suggest this is unlikely for now, and indeed the majority of those we spoke to still cite regional political volatility as the top external event that could impact Qatar’s economy in the short to medium term (beyond movements in commodity prices). It appears that the political stalemate is set to continue, with neither side in the dispute willing to back down, least of all local Qataris, who have rallied around their leadership to the point that the now-iconic Tamim Al Majd (Tamim the Glorious) image of the emir has appeared everywhere from car windows to the sides of buildings in the capital. The widespread optimism is down to two things: the fact that the economy has continued to grow in spite of the blockade, and the swiftness with which the authorities managed to expand the country’s trading network to cover the shortfall in basic goods. Prior to the blockade, Qatar relied on the countries now boycotting it for up to 60% of its imports, particularly foodstuffs. As fate would have it, Hamad Port, the new $7.4bn deepwater facility, was inaugurated just three months after the embargo was imposed. This has enabled the country to receive much larger cargo ships – ships that previously would have docked at Dubai’s Jebel Ali Port, with goods then re-exported to Qatar on smaller vessels. Turkey and Iran have emerged as key trading partners, with imports from the latter growing five-fold year-on-year, according to a Customs report released by Iran in June 2018. Alongside expanded trade routes, continuing growth levels despite the embargo are underpinning optimism in Qatar. IMF staff completed a visit to Qatar in November 2018 and praised the prudent fiscal policy, healthy financial system and accelerated structural reforms that are supporting continued expansion. Qatar’s economy grew by 1.6% in 2017, with this expected to rise to 2.8% in 2018 and 3.1% in 2019, according to the IMF. 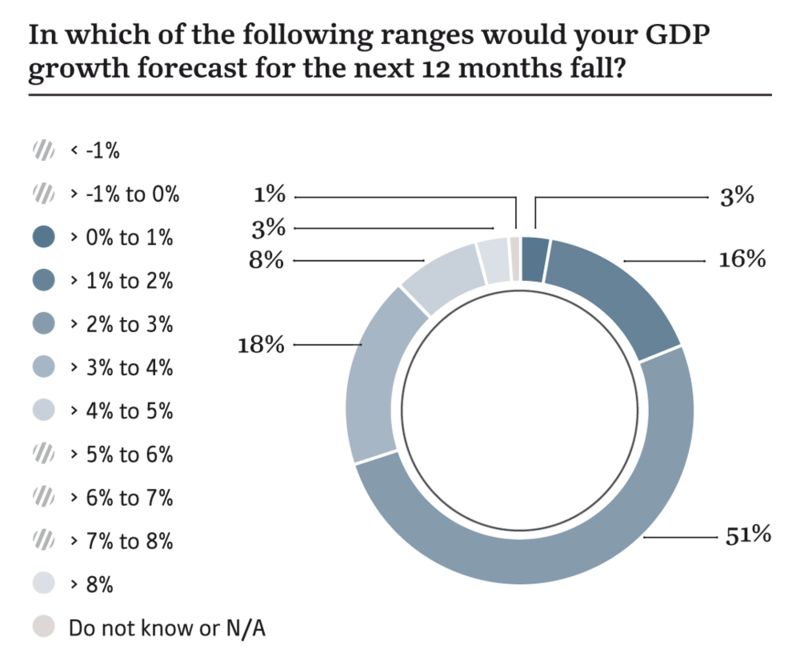 The forecast for 2019 is slightly above what the majority of those we interviewed estimated, with 51% predicting growth of between 2% and 3% over the next 12 months, while 18% predicted growth of 3-4%. Moving into 2019, the country’s second National Development Strategy 2018-22, launched in March 2018, will come increasingly to the fore. One key strategy area is foreign direct investment, with the government recognising the importance of private sector participation in the development of economic infrastructure. In particular, it is hoping to secure international capital for the development of its wastewater networks, as the plan anticipates that pressure on this infrastructure will grow substantially alongside the expansion of irrigation systems for fodder and the rising number of district cooling systems associated with new hotel and stadium builds. Given the anticipated volume of continued infrastructure development in the run-up to and beyond the World Cup in 2022, it is worth noting that a quarter of those interviewed for OBG’s CEO Survey identified engineering skills as those most in need in Qatar, followed by management at 24%.